Professional Roofing Services is a trusted choice in San Antonio, TX for residential and commercial roofing services. 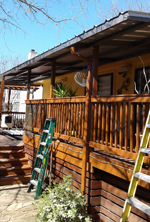 Our trusted work includes residential and commercial painting, patio remodeling, deck building, and more. Professional Roofing Services is owned by Guadalupe “Lupe” De Leon, who is continuing on the legacy his father began as a professional roofer in Monterrey, Mexico. De Leon and his family had a dream to come to the United States from Mexico and embarked on the journey here, using their roofing talents to help them earn the trust of San Antonio customers looking for quality roofing services. De Leon is licensed, bonded, and insured, providing natural roofing and home improvement services. De Leon is an expert in both residential and commercial roofing and home improvement services. Professional Roofing Services has more than 30 years of experience in the roofing industry. De Leon can be trusted to work on your home or business’s roof, as well as a number of home improvement jobs. Professional Roofing Services is best known for residential and commercial roofing services. We can provide new roofs for customers who have suffered hail damage as well as handle repairs and installations. We provide 24-hour emergency roofing services for those who need immediate repairs. Professional Roofing Services will work on both dimensional roofs and flat roofs throughout the San Antonio area. 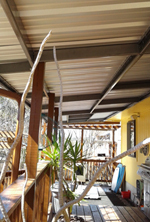 We are the roofing solutions company to trust in San Antonio and the surrounding areas. Trust the expertise of De Leon for your home or business project. De Leon is a natural roofer and a home services professional who can provide services that your property can benefit from. Call us today to get started on your project.